Presentation by the administration to the Board of Education and the public on the potential reorganization of Paw Paw High School and the tuitioning in of those students to our District. DC Trash discontinued the Bi-Monthly E-waste Service Events in Waterman and Shabbona. You can take your items directly to DC Trash. Here is there Disposal Rates. As many of you are aware, school districts participate in many different drills throughout the school year to help our students be aware and prepared for different circumstances. These drills include fire drills, tornado drills, earthquake drills and bus evacuation drills just to name a few that each school conducts. As always, continue to listen to your child(ren)’s concerns about school safety and reassure them that the school has procedures in place to help keep them safe. Encourage your children to share concerns with you and with any staff member so that we can continue to provide a safe environment for the students and staff. Do not hesitate to call the building principal if you have any questions or concerns. Indian Creek Elementary-David Mantzke, 815-824-2122; Indian Creek Middle School-Steven Simpson, 815-264-3351; and Indian Creek High School-Sarah Montgomery, 815-824-2197. 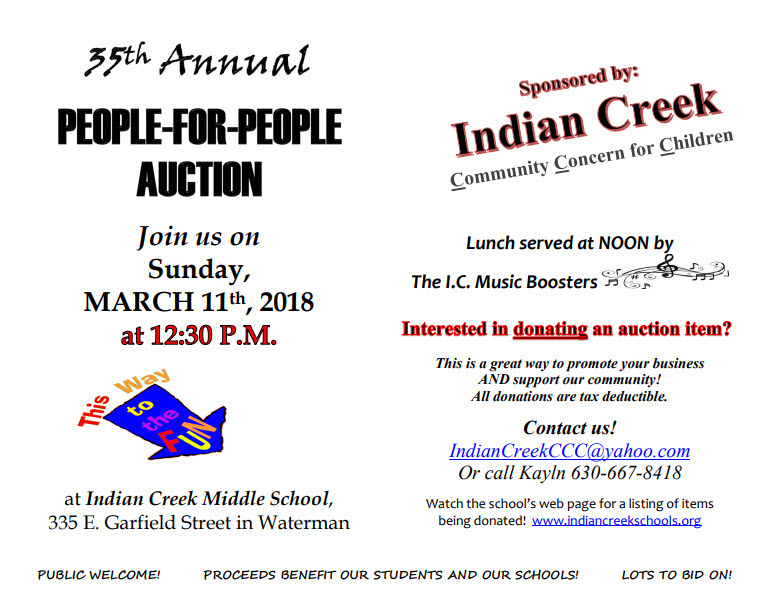 The Indian Creek CCC is presenting the 35th Annual People-for-People Auction on Sunday, March 11, 2018 at 12:30pm. The auction will be in the Indian Creek Middle School at 335 E. Garfield St. in Waterman. The doors will open at 11:30 a.m. and the auction will begin at 12:30 pm. Lunch available from the Indian Creek Music Boosters starting at noon. Contact Kayln Klotz at 630-667-8418 or email IndianCreekCCC@yahoo.com if you are interested in donating an item or have any questions. Watch the Schools Web Page, indiancreekschools.org under Our Community/Parent Organizations/Community Concern for Children CCC for a listing of items being donated! List is updated weekly! All proceeds from this auction go towards programs/items for the K-12 students in the Indian Creek School District #425. The Waterman Community Chest welcomes and encourages local Waterman youth organizations to request money for grants to be considered for our next annual fundraising event. The Waterman Community Chest have funds set aside for local youth organizations such as scouts and 4h. The Shabbona CEA Annual Egg Hunt will be at the Shabbona Fire Department on Saturday, March 31st, 2018 at 11:30am for the FREE hot dog lunch (lunch is sponsored by The Village Bible Church). And 12:00pm the easter egg hunt will begin! The Shabbona CEA is needing new volunteers! We are seeking new leadership and are willing to train. For more information, please contact Kim Freund ‭(815) 260-5443‬. Visit with the Easter Bunny!! All Waterman elementary and pre-school age children are invited! 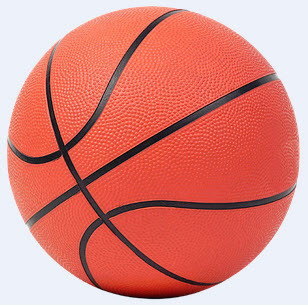 Come out Friday, Feb. 23rd, 2018, to the regional championship game at 7pm in Amboy to cheer on your IC Basketball team! Are you looking for something that is meaningful and fulfilling in your life? Well, pray about this opportunity. The N.I.C.E. Food Pantry has a position available for a pantry coordinator or team coordinators. This person or team will be in charge of the food pantry operation. You do not need to be a NICE board member to do this job. The coordinator will work with the bd. officers and report at bi monthly board meetings. Jeannie Johnson will be leaving this position in late March. She will train and be available for assistance to help the new coordinator(s). If you might be interested and want to know more about the position, please call Sandy Rueff at 815-751-0585. On May 3, 2018 Give DeKalb County will host their fifth giving day to raise funds for 501(c)3 nonprofits that are located in and/or serving DeKalb County. 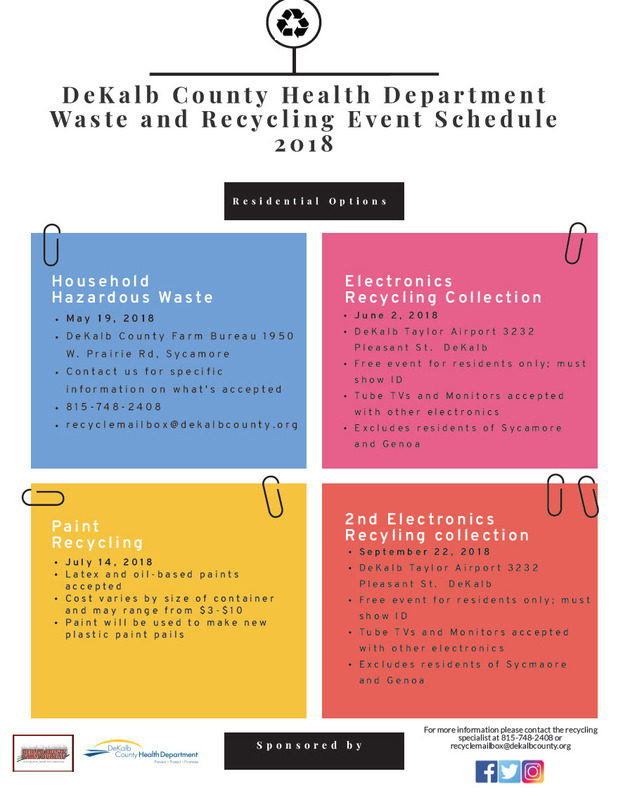 Give DeKalb County is a 24-hour fundraising event designed to build community, encourage philanthropy, connect donors to nonprofits, promote collaboration, and raise awareness about the nonprofit sector. Donors of all ages and walks of life are encouraged to express their generosity on May 3, 2018 and they hope you will join them in this extraordinary philanthropic event! Waterman Community Building (Lincoln Highway). Registration deadline is February 19th!!! Save the date…March 3rd is Waterman Summer Rec Family Night at the Rockford Ice Hogs Game, more info to follow!! REGISTER NOW!!! GIRLS SOFTBALL & CO-ED Tball Registration! Open Registration from January 17-th - February 15th 2018. Girls softball grades 1st - 8th grades and T-ballers that are minimum age 5 & currently in Kindergarden are eligible to register! Season runs Mid May thru end of June! If you are interested in Coaching let us know! Contact us at indiancreekrec@yahoo.com OR like our page on facebook and message us there! *All coaches must complete a background check. DeKalb County Convention & Visitors Bureau guide! Thurs. Feb. 22, 2018 9:00 – 11:00 a.m.
DeKalb Co. Community Outreach Bldg. 35th Annual People For People Auction! Sponsored by Indian Creek Community Concern for Children! Join us on Sunday, MARCH 11th, 2018 at Indian Creek Middle School, 335 E. Garfield Street in Waterman. Lunch served at NOON by The I.C. Music Boosters. This is a great way to promote your business AND support our community. Contact us at IndianCreekCCC@yahoo.comor call Kayln at 630-667-8418! Watch the school’s web page for a listing of items being donated! PROCEEDS BENEFIT OUR STUDENTS AND OUR SCHOOLS! begins January! See you there! 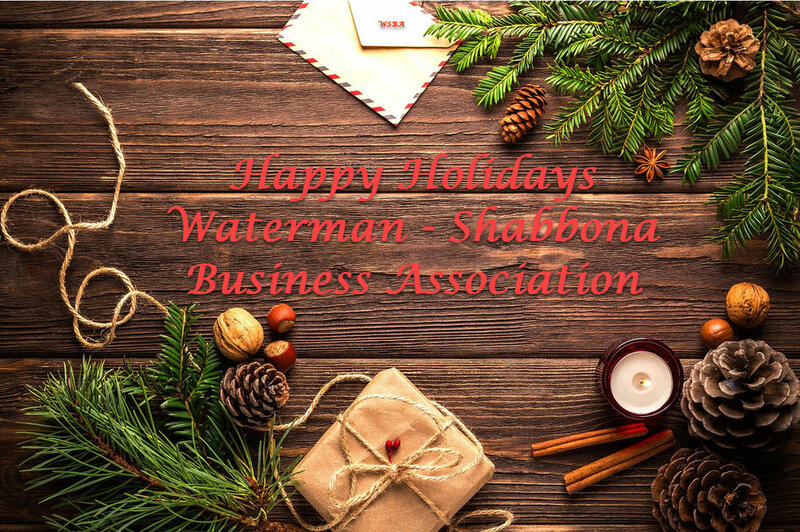 Waterman - Shabbona Business Association! Please join us for a ribbon cutting ceremony to celebrate the new location of Foster’s Financial Management, LLC and Foster’s Tax & Accounting, LLC at 311 W Comanche Ave. in Shabbona. Would you like to support your local library this Christmas Season?